Levels of income in Devon are lower than the national average. Figure 5.2 displays average full-time annual pay in Devon compared to similar local authorities and the England average. The blue dots show the average (median), the red dots the 25th percentile (the point at which one quarter of full-time workers earn less than, and the green dots the 75th percentile (the point at which one quarter of full-time workers earn more than). This reveals average full-time annual pay in Devon (£24,452) is less than the national level (£27,500), and similar local authorities. 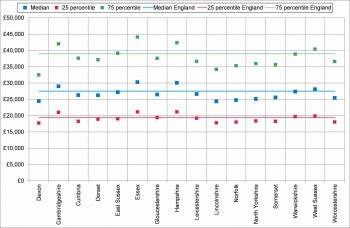 Whilst the lower pay 25th percentile point is lower than the national level (£17,736 compared to £19,403), more notable is how much lower the higher pay 75th percentile point in Devon (£32,498), than the national average (£39,000) and similar local authorities, such as Essex (£44,095), Hampshire (£42,370) and Cambridgeshire (£42,022). This pattern contributes to the high cost of living in the county. Figure 5.3 shows that although employment rates are relatively high in most areas of Devon, wages are low with median wage levels in Mid Devon, North Devon and Torridge in the lowest 10% across Great Britain. Notable differences are also seen between average male and female annual earnings. In 2014 average pay for male full-time workers (£26,085) was more than £5,000 per annum higher than female full-time workers (£20,856). When the average for all workers is considered the difference between male workers (£24,571) and female workers (£14,500) is more than £10,000 per annum, on account of a larger proportion of women working part-time.